One taster calls it “the most confusing discussion with a winemaker ever.” I can’t quite go that far, since I’ve conversed with Nicolas Joly on more than one occasion, but it’s close. The wines of Paolo Marcarino are not, I think, well-known. If there’s a web site, I can’t find it. No one I (very casually) survey in the Piedmont has ever heard of the producer. And to be completely honest, even we are only here for one reason. That reason? To taste unsulfured barbera. A bit of contextualization might be helpful. The natural Piedmontese reaction to anything that the winemaker with whom one is currently speaking is not themselves doing is inevitably negative. Negative in the extreme. On which subject more in a future post, but “impossible,” “stupid,” “insane”…these and similar terms are regularly and widely deployed in the service of decrying whatever techniques a given winemaker does not use, but that their neighbors (real or imagined) might. Often followed by an overall condemnation of the producer doing that very weird thing. It’s all a little soap operatic, to be honest, and while it’s hardly unique to this region, it has been raised to a bit of an art form here. So it’s easy to imagine the warm embrace with which a senza solfiti wine is greeted in the region. Or rather: would be greeted, if anyone had heard of it. But that’s why we’re here, now. There’s the usual cellar tour – tanks, barrels small and large, nothing really out of the ordinary except a little machinery that I will detail in a moment – and recounting of the family history. Nothing exceptional there, either: their own vineyards, expanding a small family estate into something more aspirational, etc., etc., etc. A story heard hundreds of times by anyone who’s visited many producers. 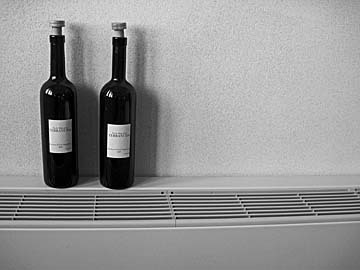 The ink for this story is still fresh…a cellar not yet finished, labels not yet affixed…and so, aside from the sulfite issue, the most interesting aspect of the visit is to taste at the point of transition. On the point of the fulcrum. Which way will the balance tip? We hear from the family for a while, mostly on matters historical, but speechifying is soon turned over to the not-the-oenologist, Mauro de Paola*. The turnover follows closely on the heels of a self-reflective question: “how can we distinguish ourselves?” This is a question every winery should ask itself – especially in the context of our barbera tastings, in which there seems to be a dismaying pressure to conform to an international style – but of course the answers to that question can lead to dramatically different results. *Mauro de Paola is introduced to us as the oenologist during our visit, but described as a “friend” and decidedly “not the oenologist” in subsequent email exchanges between our translator and the Marcarino family. Whatever his title, he does a good 50% of the talking during our visit, including answering all the technical questions. Does it really matter whether or not he has a title? No, not to me. But it’s one more element of confusion in what will prove to be a very confusing encounter. Paolo Marcarino 2009 Barbera d’Asti “Zeroincondatta” (Piedmont) – A no-added-sulfite barbera, one of the very few in the entire region (that is to say: I don’t personally know of another, but someone might). This is, compared to other barberas of the region – even the pushed-ripeness variety – very violet-purple in color…a color that one often encounters in the absence of sulfur, no matter which grape varieties are employed. There’s also the spiky brittleness expressed alongside a prickle of (pleasant) volatility that seems to come with the genre, and which I’m told derives from the particular sort of semi-carbonic fermentation necessary when working without sulfur. As for the rest: lavish acidity, fruit in the grapey/blueberry-ish range, and fine-grained, overtly crystalline tannin. It’s pretty, but there’s a hint of highly-tinted mascara (think Donna Mills in Knots Landing) to the attractiveness; not that I mean to suggest that the wine’s made-up or artificial, just that there are some showy, lurid aspects to its visage. Acid asserts itself as the finish progresses. I like this a great deal. A “great barbera?” I don’t know. It’s a very good wine, but it’s also pushing and tearing the envelope that I consider to envelop barbera’s typicity. That’s not particularly unusual when comparing no-added-sulfite wines to their normally-elevated brethren. If it means anything, it’s the best no-added-sulfite barbera I’ve ever tasted. (Also, by definition, the worst, as it’s the only.) Beyond that I can’t really say. We go on to taste a second barbera, and though the word is not used, it’s clear that this is the “serious” one, from what they perceive to be their best terroir and the beneficiary of what heft-inducing cellar practices they’re willing to employ. Paolo Marcarino 2007 Barbera d’Asti Terranuda (pre-release) (Piedmont) – Made from vines planted in the 1920s, and enhanced by the addition of the pressed juice of dried-on-mats grapes; juice that comprises 20% of the finished wine. 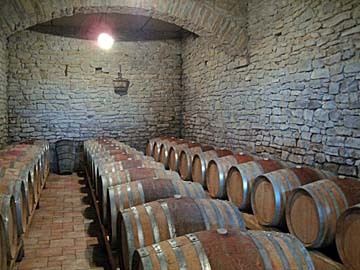 Post-fermentation, the wine receives its first dose of sulfur and is then put in barriques for one year. As with almost all dried-grape red wines, there’s a noticeable spike of volatile acidity that has a little bit of a slapfight with the dark, dusty aromatics. Despite its lifted beginnings, it’s a clenched fist of a wine, not overly marked by its wood, and delivers a long finish that grows juicier as it lingers. This needs time to expand and develop, obviously, but I think it will be impressive one day. Right now, it’s mostly just big. For some tasters, the addition of dried-grape must at 15-16% alcohol (not mirrored in the finished wine, I should add) is a little bewildering. The wine doesn’t lack size or power, and wouldn’t seem to lack either even without the dried grapes. Viewed plainly, this is the oenological equivalent of blood doping…a term I hesitate to use because unlike in sports, it is not only not disallowed but in fact rather traditional in winemaking, but which is the best non-wine analogy I can come up with, and for which I beg a sympathetic reading. Yes, it “works.” But is it necessary? The discussion which stems from a few attempts to ask this question is where things get confusing. I will do my best to present the winery’s case (almost exclusively as presented by the not-the-oenologist), interpolated with my own reactions, but it’s important to note up front that I am not assessing the correctness of the winery’s assertions on any point of practice, only responding to them. And one final disclaimer: all of this is based on a near-simultaneous translation, so there are multiple opportunities for errors and shifts in meaning between the speakers’ intent and this reporter’s understanding, for which I must preemptively apologize. The assumptions and preconceptions in this triptych are manifestly obvious. Here we have a producer whose practices would be decried by many of their peers (and from both directions) finding a target that they can decry, and then wasting little opportunity to do so. All of these positions are defensible and arguable, both in theory and in practice, and while (as noted earlier) the dismissal of others’ practices seems to be par for the regional course, this dismissal seems not to be rooted in a philosophy or firm set of oenological theories, but instead in a rather confused jumble of contradictory thoughts. That requires some unpacking. 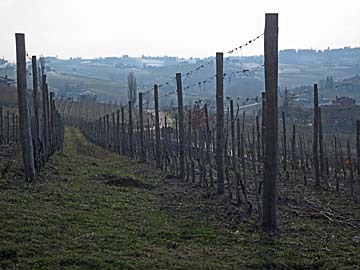 The above having been said, an additional piece of information about the “Zeroincondatta” barbera is proffered: the wine is put through micro-oxidation. (“Everything else is traditional” is the very slightly defensive coda…though a cooling system for the press is later mentioned, and temperature control to manage oxygenation, and CO2, and then of course there are those inoculated yeasts. “Traditional?” As always, it depends on which producer and time period one chooses to identify as the basis for that tradition.) Later, in response to the aforementioned questions about dried-grape additions to the Terranuda, it is asserted that this is necessary to “manage tannin” (apparently, the old vines are naturally inclined to excess in this regard). Of course, there are other ways to manage tannin, and since they’ve already the technology for one of them in the cellar, I ask the obvious question: why not use micro-oxidation? Well, OK. Let’s assume that this is true. Then why are they using it on the senza solfiti barbera? The most delicate, fragile, unpredictable wine in the portfolio…and it gets a micro-oxidative roll of the ten-sided dice? This makes absolutely no sense. I don’t know if the silence that greets this statement is real or just imagined as a consequence of the bewilderment in my head. I understand that the use of barriques to achieve faster oxygenation is a possible approach, but I admit to not understanding how that so effortlessly becomes “mandatory.” Like so many other discussions of the desirability of small French oak, it also elides the explanation of why botti are either no longer an option or a lesser option, despite their ubiquity in the region. Ultimately, I wonder if all this discussion of tannin management and oxygenation might not be a red herring. Late in the visit, the not-the-oenologist suggests another possible reason for the buffing-up of the Terranuda: “the press tends to like bigger, more muscular wines.” Well, maybe, and maybe not. But just once, I wish a producer would admit this up front, and dispense with the circuitous steps of the natural/technological/traditional/modern ballet that convinces only the credulous. Anyway, there are more wines to taste. Paolo Marcarino 2009 Cortese (unfinished sample) (Piedmont) – I don’t know what the appellation for this wine is or will be. It’s still extremely cloudy (cross-flow filtration is in its future), made without the addition of sulfites, and it’s fabulous. It explodes in a burst of flowers and piercing, razor-edged acidity that lashes that palate like a cat o’ nine tails. Eventually, it narrows to a thin wedge of steel. I suspect that, once tamed for commerciality, there will be a little less ordinance here. But it’s fun while it lasts. Paolo Marcarino 2007 Moscato d’Asti “Lucifero” (Piedmont) – Paper scented with mercaptans, and not particularly sweet even within its genre. This reminds me a bit of a Léclapart Champagne, and it also reminds me that I’ve never liked Léclapart Champagne. Orange blossom and some freshly-fired ash contribute to the discussion, but only in monosyllables. Many of my fellow tasters like this, but I do not. Unthreading the definitional contradictions in that statement would take hours, and I’m not going to attempt it here. In any case, it is of a piece with the winery’s very confusing – or, if I’m inclined towards uncharitability, confused – thoughts on their purpose and the methods by which they are achieving that purpose. In the end, for some (and sometimes for me) the only important conclusion is this: except for that moscato d’Asti, this is a winery that produces very good wines, very interesting wines, and occasionally both at the same time. To the extent that one cannot drink a philosophy, the quality of the wines is the only thing matters. And then again, it does. Philosophy and purpose inform viticultural and oenological decisions. Those decisions lead to stylistic outcomes. Consistency of philosophy or purpose are not in any way the same thing as quality, or even consistency of quality, but they do matter. They matter because in an overwhelming world of options in which no one can taste everything for themselves, nor even truly follow others’ collective efforts towards this comprehensiveness, tools to aid in the winnowing and selection process are essential. Applied philosophy in the vineyard and cellar, and the open knowledge of same, is one of those tools. Not a 100% reliable one, and always subject to evaluation and evolution of preference, but a helpful tool nonetheless. A winery that does not have a clear and consistent answer to “why” will also, except by accident, not have a clear and consistent answer to “how.” And thus, this tool is removed from the workbench, increasing the informational entropy for any potential customer. The cynical reader might naturally be inclined to view the no-sulfite regime here as bandwagon-jumping for the purposes of differential marketing. Certainly more than a few winemakers and journalists in the region will offer that exact interpretation without prompting. While I could never be considered to lack cynicism, I think it’s far too early to accuse or excuse. Time and the market will work their pressures, we’ll see how the winery responds, and only then might we be able to draw some tentative conclusions as to definitional intent. And given that time, maybe the answers to the difficult questions of practice and purpose will find clearer, more consistent answers.